Hello Everyone! Happy Monday! OMG…it is beautiful today. Right now it is 65 degrees outside and it is sunny. I have my window open in my craft room and I can hear all the birds singing. I get so happy this time of year when the days are longer and the temperature rises. Right now, I am experiencing a book crazy and reading. reading and did I mention reading? I just can’t get enough books. So I think I may head out to my deck after this post and do just that. But first, I must share my lastest card. 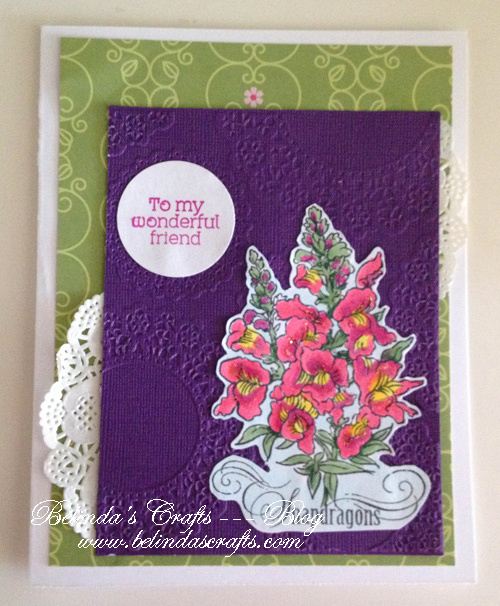 I made this friendship card and I used my new embossing folder and added a doily for even more texture to the card. I used my copics to color up the image and some glitter glue to add a little something, somethin’ to the flowers. 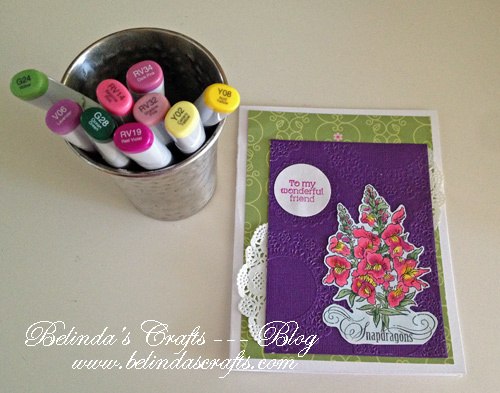 I decide to just show the colors I use in a pencil jar I borrowed from the boys. I had fun coloring these snapdragons. They are one of my favorite flowers in the garden. I will share pictures when mine bloom.